Looking for hotels near Lake Kawaguchi? Providing free WiFi and a garden, HOSTEL MICHIKUSA-YA offers rooms in Fujikawaguchiko, a 10-minute walk from Lake Kawaguchi. Guest house Minori-an is located in Fujikawaguchiko, 0.7 mi from Lake Kawaguchi. 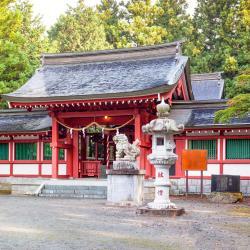 The property is a 3-minute walk from Kawaguchiko Red Line Bus Stop Number 22. Kawaguchiko Urban Resort Villa offers accommodations in Fujikawaguchiko, 131 feet from Lake Kawaguchi. Guests benefit from terrace. Taiheikan provides accommodations in Fujikawaguchiko. With a shared lounge, the 3-star ryokan has air-conditioned rooms with free WiFi, each with a shared bathroom. Located in Fujikawaguchiko, 1.8 mi from Lake Kawaguchi, Villa Resort Yumefuji features each room with a private garden with a terrace. Kawaguchiko Station is just a 5-minute walk away from the villa. The villa provided an amazing view of Mt. Opened in December 2016, HOTEL MYSTAYS Fuji Onsen Resort features free WiFi throughout the property. The hotel is set in Fujiyoshida, 1640 feet from Fujikyu Highland. it's pretty close to my key destination- fujiQ highland. the onsen is ok. Right on the shore of the scenic Kawaguchiko Lake, Hotel New Century features spacious Japanese-style rooms overlooking the lake and Mount Fuji. The amazing location which allows you to see the lake and Mount Fuji and the fireworks in comfort. Overlooking Mount Fuji and Lake Kawaguchi, Fuji View Hotel offers spacious accommodations surrounded by gorgeous Japanese gardens with lush greenery and cherry trees. We love the property owner Daichi, who is cheerful and very helpful. Just a 1-minute walk from Kawaguchiko Train Station and located in the scenic Mount Fuji area, Plaza Inn features karaoke and massages and offers free parking. Great location; we could see Mt Fuji from the window. Sundance Resort Yamanakako is located in Yamanakako. All rooms have a kitchenette and a private bathroom. Lake Yamanaka is 1.6 miles from the hotel. Absolutely loved the location and how big the place was. Its amazing and clean. Located in Fujikawaguchiko, 3.2 miles from Lake Kawaguchi, Sundance Resort Kawaguchiko has rooms with free WiFi access. We stayed off-season over Christmas for 3000 JPY per person - excellent value for money. Open from April 2015, this hotel features comfortable guest rooms and free WiFi. Very nice staff. The breakfast was really good also. Very confortable bed with mount fuji view!! Located right next to Fuji-Q Highland Amusement Park, Highland Resort Hotel & Spa features Mount Fuji views, large hot spring baths and spa facilities. nicely sized family room with ample beds for everyone. Hotel Mt. Fuji features a hot spring bath with views of Mount Fuji, a sauna and a karaoke room. It offers free Wi-Fi throughout, 3 dining options and a charged indoor pool. Everything. The hotel stands alone and situates on a hill overlook yamanakako lake. Offering magnificent views of Mount Fuji and Lake Shoji in every room, Shoji Mount Hotel features 2 large public baths, which are open 24 hours. Kawaguchiko Station is a 35-minute drive away. The room space was great for 3 people. Fuji san is right in front of the balcony. 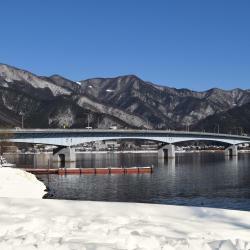 Hotels with great access to Lake Kawaguchi! Just a 5-minute walk from Kawaguchiko Station, JINYA Fujikawaguchiko is located in Fujikawaguchiko. Free WiFi, private parking, a washing and drying machine are provided. Super clean and amazingly convenient for arrival by train from the nearby Kawaguchiko Station. Offering beautiful Mount Fuji views from its hot-spring baths, guest rooms and hot tub, Mizno Hotel is a 5-minute drive from Kawaguchiko Train Station. The breakfast was really great and the service is impeccable! Hoshinoya Fuji is a glamping resort nestled in a tranquil red pine forest, featuring a restaurant, bar and guestrooms with Lake Kawaguchi views. The best hotel with Fujisan view. We were so lucky that the sky was clear while we stayed there. Located right in front of Lake Kawaguchi in the Mount Fuji area, Fuji Lake Hotel offers spacious accommodations with mountain or lake views. Mt. Fuji view from our room and private bathroom. Good service and price is reasonable. Guest house Sakuya is a 15-minute drive from Kawaguchiko Train Station and offers rooms with views of Mount Fuji. It features a public bath, free Wi-Fi and private parking. Exceptional view from room, Onsen was really appreciated. Nestled right on the foot of Mt. Fuji, Sawa Hotel provides shuttle services which can take guests to Fuji-Q Highland and Kawaguchiko Station within 5 minutes. The location is good and the lobby is good for gathering till 11.00pm. 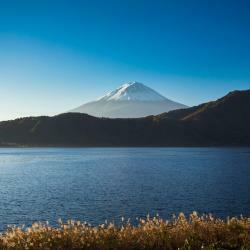 People are talking about Lake Kawaguchi! Explore guest hotel reviews featuring "Lake Kawaguchi"
Even though they call themselves a hostel, my friend and I booked here and got a private room with a shared Bathroom and Showers. although the shared part is what defines the place as a Hostel, it felt more like a Ryokan (hotel with traditional rooms). Everything here was so nice; the staff was friendly and although it is a little bit out of the way, there is easy access to Lake Kawaguchiko. I highly reccomend for people to stay here when Visiting Kawaguchiko. Greatest view of Mt. Fuji and Lake Kawaguchiko also the breakfast was very good and the taste was delicious. Staff were good and nice, they trying best to communicate with us :) .The hotel has a shuttle bus from the Kawaguchiko station to the Hotel. They also provided the Japanese dinner set (Kaiseki) at the hotel. The outdoor onsen also great. -Very near to Kawaguchiko Station, shops, and Lake Kawaguchi. -The manager is helpful and speaks good English when explaining thongs to us. -We were given a room with direct view of Mount Fuji. It's such a wonderful experience. -Comfortable hot onsen facility right inside the hotel. -Clean and comfy traditional japanese style room. The location was beautiful, just in front of the beautiful Lake Kawaguchiko. The staff were really nice and friendly, we were offered great services, and especially, the breakfast service was amazing! The highlight of this hotel is its onsen ( Japanese hot springs) with a private view! The beautiful Lake Kawaguchiko is just in front of the hotel. I love the different colors of autumn leaves, ducks in the lake, the low clouds on the water in the morning. Mount Fuji on the opposite site of the hotel is so grand. The onsen is amazing. Like really amazing. The views from the front of the hotel have a great overlook of Lake Kawaguchiko and Mt Fuji on the side. The staff were very lovely and available during most of the day and night. Mt Fuji could be seen from the room on a clear day. The hostel is located a short walk to Lake Kawaguchi Ohashi Bridge that offers a good view of Mt Fuji. There are ample parking space beside the hostel. Hotel is rundown, but excellent location! Can view Mount Fuji from hotel, and is facing lake kawaguchiko. Beautiful park in front of hotel, and next to herb hall.